Gorgeous Spirit of Tradition cruiser of the highest craftmanship and beauty. 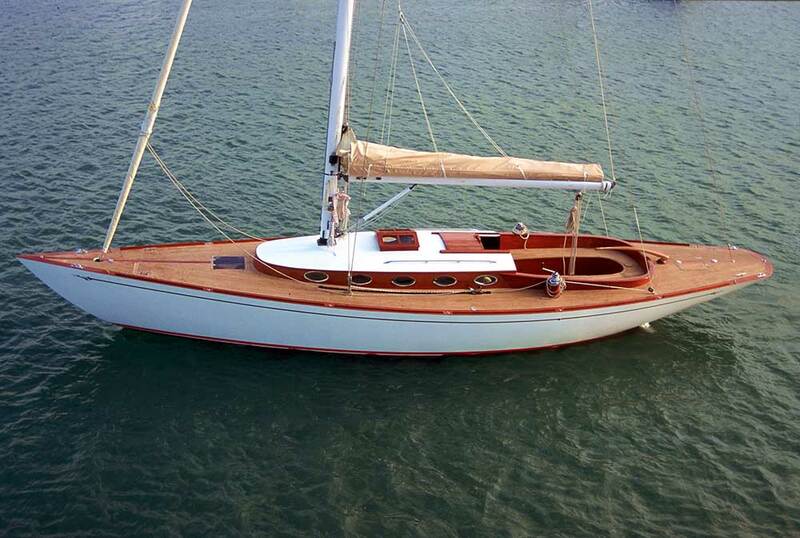 She is in perfect shape and allows also for longer distance cruises than initially aimed to. She is offered at a very low price. Íñigo Toledo, owner and Director of Barracuda Yacht Design, is among the Spanish Naval Designers, the most focused on classic and Spirit of Tradition design. Many are his achievements in this particular sector and one of his best designs is precisely that of the 46 footer for Astilleros Mediterráneo, introduced to the press in 2001 and launched in 2003. It was the middle model of a range of sportive vessels conceived for the Sea that names the Yard itself. It was really a pity that the crisis that crudely hit the nautical market a few years later did not allow the success that this range deserved and still deserves as neither their pure lines nor their sailing program are out of fashion today and Astilleros Mediterráneo can still build them as new boats. The Med 46 has a magnific deck shape, with ample side-ways, a comfortable cockpit with radiused coamings, reflected on the radiused forward end of the coach-roof. The elegance of this design surpasses on our opinion that of its British and American rivals: the first as they are too modern and groundbreaking, the others because the opposite reasons: too old and conservative. Although the Med 46 was conceived as a day-sailer some of its features make her fit for longer cruisers: the comfort down below, the fresh water capacity and especially the fuel one, the presence of demountable elegant stanchions all this allow for medium distance sailing. We can affirm that Astilleros Mediterráneo high craftmanship has stood the test of time: on the Med 46 is a pleasure to look at the constructive and finishing details either on deck and down below. The modern wooden building technologies allow us to forget the classic “servitudes” of the past. A Med 46 is not to be compared to any common boat of present days. It is like a trip to the past, with the modern sailing comforts and from this point of view this is the best product of the market. The present unit is being offered in perfect sailing trim. She has been always serviced at the building Yard and she has an exceptional price compared to her features, her maintenance shape and her beauty.